Another lever design wine opener, and another plastic one, how will this be any different from the rest? 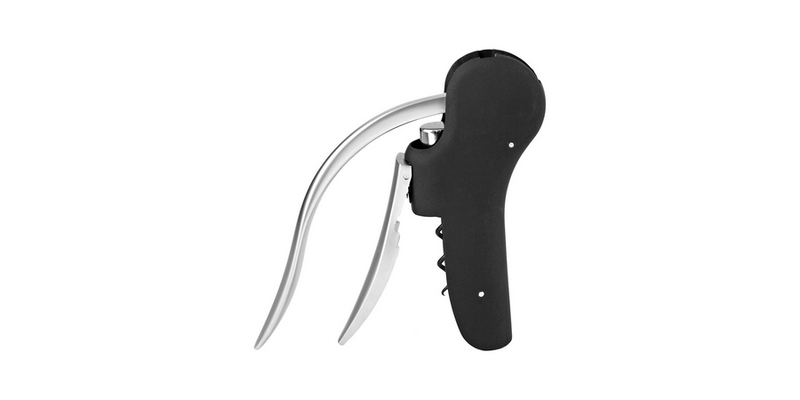 I personally like lever designs (or I how I usually call them “broken butterfly”), because they are entirely easy and very reliable, no twisting required, let’s see if True Fabrications Nautilus Wine Opener has what it takes to make a good one. First of all I would like to start with a complaint, it’s made of plastic, nothing else would be as bad a making something that needs to be entirely durable out of plastic, this causes me to have second thoughts on opening a tough bottle with this, the lever, of all things had to be plastic, if this part breaks it will render the opener useless. Using this True Fabrications Nautilus Wine Opener is fairly straightforward; just slide it on to the bottle and grip the clamp handle (the smaller one) tightly and raise the longer lever up, this will remove the cork instantly, after that just lower the handle and clamp the cork, raise the lever to remove the cork, it’s very simple. The entire process of removing the cork from bottle is surprisingly smooth; I guess you won’t need to worry about the plastic handle after all since you don’t need much force to draw the cork; this is definitely suitable for those who have weaker hands, like the elderly. The grip and feel of this is surprisingly comfortable, but not durable, so even when you have a good grip on it and its locked on the bottle you will still be afraid that the lever might break, another thing about the lock is that it doesn’t really hold on that well to the bottle, you have to be really sure that is has been gripped well, or it will slip off and who knows what that will lead too. It comes with a simple twist foil cutter and an extra worm just in case the first one loses its shape or breaks; this one seems a lot more reliable than other plastic openers that share the same mechanics. Looks like the Nautilus did a pretty good job with this one, it’s not cheap but it certainly gets the job done, I definitely buy this True Fabrications Nautilus Wine Opener Set for those who are having a hard time with regular openers that are very taxing on their hands.